It's already that time again! 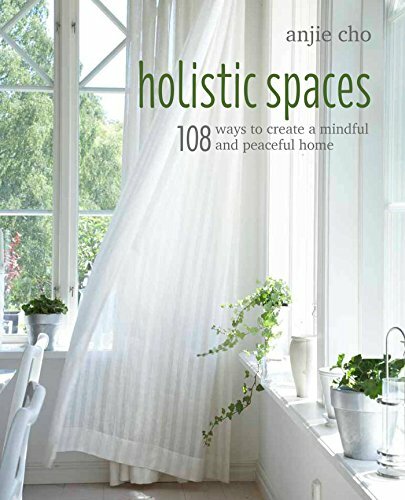 We've curated another Holistic Spaces Holiday Gift Guide to help you find the perfect gifts for everyone in your life. Lots of us go into the new year with resolutions for self-improvement, so this year's gift guide is tailored to help achieve those goals! From meditation to essential oils to yummy teas and more, we've chosen 12 amazing options for anyone seeking to find peace and holistic wellness in 2018. We also recommend giving a listen to some of our favorite podcasts, including Episode 051: Creativity and Feng Shui with Laura Morris, Episode 048: Essential Oils and Feng Shui, Episode 024: Creating Holistic Spaces for Inspiration and so many more! Feel free to share some of your favorite self-improvement tools and Holistic Spaces posts in the comments! Essential oils can be wonderful tools for self-care and self-improvement. This necklace can be paired with an essential oil for an amazing gift. Listen to my friend, Andrea Giordano on podcast Episode 048: Essential Oils and Feng Shui, for some inspiration on different essential oils. Essential oils can help in a variety of areas, from improving focus to lifting mood, treating headaches and much more. This personal diffuser is the perfect introduction to using essential oils for healing, inside and out. Add a drop of your selected oil to the porous lava rock inside, and enjoy personalized olfactory treatment for hours! You can even carry drops in the vial that comes along! With box subscriptions more popular than ever, I'm excited to see a box set geared toward happiness and self-improvement! TheraBox is curated by therapists and filled with research-backed activities and goodies to enhance your mood and life! Each monthly box includes one happiness-boosting activity and "5-7 consciously crafted, natural, organic, or artisan self-care wellness goodies to promote relaxation & wellbeing!" Past boxes have included mud masks, incense, journals, planners, aromatherapy inhalers and many more incredible self-care items! The type of clock you use in your space, may seem trivial, but an analog clock can be symbolic. An analog clock represents the idea of time as a cycle that starts over anew each day, giving us continuing hope. I love this simple, elegant analog alarm clock from Amazon. It's made of real wood, silent, battery operated and is a perfect fit for any space. It's also small enough to travel with and serves as a nightlight as well as a clock. What a great way to carry the feeling of hope throughout your own holistic spaces and those you visit! One of my favorite hobbies is the Japanese art of Sashiko, needlework quilting. I've received many compliments on my projects recently! This sourcebook is my go-to and is ideal for those interested in getting into Sashiko or starting a new hobby. Susan Briscoe's guide includes an introduction to Sashiko, a list of what you'll need to get started, step-by-step patterns for your projects and beautiful inspiration by Japanese textile artists! It's the perfect gift for readers, crafters and learners, and Sashiko can easily serve as a way focus your mind and gain a little clarity around whatever is going on in your life! It's difficult to talk about improvement and self-care without mentioning meditation! This practice has been life changing for me, whether on a cushion or in more active styles like Ikebana. One of my recommendations for meditators is to create a holistic space dedicated to meditation. You can include altars, special items and more, but don't forget the meditation pillow! This set from Samadhi is the ideal combination, featuring a sitting cushion as well as a larger, flat cushion to protect the knees and ankles. Not sure if your gift recipient would like meditation? Read up on it here and here and listen in here! Another of our favorite people is artist, Amy T. Won, who creates stunning paintings in her beautiful holistic studio. Amy's art is based on her observations of the natural world, and she's even created a 12-week online course for reigniting creativity! This set of cards follows that train of thought, aiming to reconnect with nature and creativity. Amy's Wonder Walking Deck "features intuitive mood paintings and explorer notes from the pages of my personal sketchbook, inspired by Spring and Summer’s wonder-walks." The deck makes an incredible gift for artists, art lovers or anyone seeking to rekindle the fire of creativity. Whether you're experiencing challenges or just hoping to get to know yourself better, journaling is an excellent way to fill your own cup and keep track of your goals and achievements. I love this eco-friendly journal, handmade in Nepal! Each page of the notebook is created through an ancient process of cooking and drying the fibers from Himalayan Lokta bushes, and the cover is colored with varying vegetable dyes! Not only does this journal provide a beautiful place to capture and explore your thoughts, it contains rich Nepali history and supports individual artists in the Himalayas! I love adding plants to holistic spaces. They bring the wood element and nature into your space and are excellent tools for increasing indoor air quality. In his book, How to Grow Fresh Air, Dr. B.C. Wolverton lists 50 houseplants proven to reduce VOCs and other harmful pollutants in our indoor spaces. The rubber plant is one of the highest rated plants due to its ease of care and ability to remove airborne toxins. Affordable, effective, healing and easy to care for, a rubber plant makes a beautiful, loving gift that keeps giving! For friends and relatives dedicated to, or experiencing, personal growth, the Ketu yantra mandala is an incredible, meaningful gift and a beautiful addition to any space. This mandala relates to spirituality, healing and introspection and connects directly with the New Beginnings and Knowledge (or self-cultivation) bagua areas. Perfect for New Year's resolutions! The Ketu mandala actually has a yin, meditative energy, so it's also perfect for a meditation space! Another beautiful Asian tradition I love is Furoshiki. Furoshiki is the art of Asian fabric wrapping, rich in symbolism and making its way to the western world. Furoshiki uses cloth to wrap a variety of objects, and the ties in the fabric represent ties between the individuals giving and receiving the items. Furoshiki is a way to offer great care and detail in how we present our gifts and feelings to others. It is even touted as a great communication tool. This book teaches basic Furoshiki tying as well as more intricate and elaborate styles of tying, including specific examples like bottles, books, scarves and more! I don't drink coffee often, but tea is a different story! I keep a collection of teas in my kitchen, and each of them serves a different purpose, much like the tea selections in The Republic of Tea's Wellness Tea of the Month. Perfectly curated to soothe whatever ails you, these blends are ideal for relaxing, finding energy, fighting sickness and even getting back on your feet. My good friend Susan Chan has just launched Amà designs: Feng Shui inspired malas! Malas are meditation beads and intentional reminders encouraging growth in specific areas of your life. Worn on the body or hung in a living/work space, each mala is blessed with a sacred intention and mantra. New York-based artisans knot the malas and make each tassel by hand. Susan even provides feng shui directions on how to infuse it with your specific intention. Our favorite is the Unconditional Love Mala, what everyone needs when starting the new year. Be loving and compassionate with yourself when taking steps toward your goals.